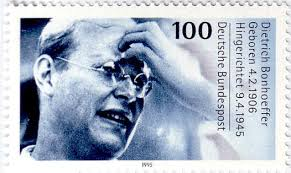 I was in the middle of preparing Lent talks on tw great Christians of the twentieth century, Dietrich Bonhoeffer, martyred for his opposition to Hitler, and Toyohiko Kagawa, the ‘Gandhi’ of Japan, when the post arrived. With a packet of papers for a meeting, a discounted subscription offer to Saga magazine and an ad for hearing aids was a single and singular letter. It was from the chaplain of North Devon College. ‘Dear Colleagues’ it begins – (Ah! the strings of fellowship vibrate gently.) The first paragraph is about Mike, who ‘has vast experience of serving God’ here and in the US and is co-leader of the Christian Union. The Christian Union ‘would like to do something special to get others to think about Easter’. What the vastly experienced Mike has come up with is distributing over 1,000 Cadbury’s Easter eggs. These will have an appropriate text attached. In this way the good news of Easter will be shared. Call me a theology duffer – I certainly haven’t got the hang of this post-modernist stuff - but the connection between an empty tomb and a spheroidal casket of milk chocolate encased in foil and encompassing a very sweet white sticky substance surrounding an equally sweet and sticky orange substance eludes me completely. If such a confection gets me to think about anything it’s the dentist. Is pain the connection? Is my cavity the tomb? What sort of impact will 1,000 texted eggs make alongside the more than 1.5 million eggs laid daily by the Cadbury’s Creme Egg plant, which, end to end, would stretch all the way from the Bournville factory in Birmingham UK to Sydney Down Under? A rather pointless exercise, sure, but then neither of us is, I assume, a purveyor of candy and au fait with marketing techniques. I’d put the eggs in for the marathon where they can make a mad scramble for the finish. Returning to the proposal, what of the text? Cadbury’s themselves are using this one: Dip in the goo to unleash your naughty, playful side! Mm! I’m not sure that will strike a chord with the Mothers’ Union. It suggests something a little more risqué than singing ‘Lord of the Dance’. Nor could previous Cadbury campaigns be said to plug into the Christian message. There was the Shopkeeper campaign of the 70's in which a boy asked for 6000 Cadbury Creme Eggs, which seems at first glance to be more about gluttony. Then the Irresistibly campaign which showed characters prepared to do something unusual for a Cadbury Creme Egg. (Memory failure - rein in the imagination!) Aren’t we supposed to resist temptation? In 1985 the How Do You Eat Yours? campaign began which, in years following, ‘was achieved through the zodiac signs’, more Glastonbury than Easter festival. From 1994-1996 Spitting Image characters showed us ‘How To Eat Yours?’ Then there was Shooting Stars followed by the Pointing Finger campaign, and last year The Eggmeister Returns campaign. Cadburys are not the only ones campaigning. We are being asked to join a Campaign for the "King Size" Creme Egg - a Creme Egg one and a half times bigger than the standard size. ‘If you like the idea and would like to help us lobby Cadbury to develop the product, please show your support by adding your name to the "King Size" petition below.’ Eggscuse me if I don’t. But bigger eggs might be easier to swallow than eggs with texts. Let’s get to the hard-boiled question: What text will the college boys and girls affix to the eggs? ‘Man does not live by bread alone..’,. ‘eat, drink and be merry for tomorrow we die’. For further inspiration I consult the concordance, which offers only two examples of the singular egg. Job asks, ‘is there any taste in egg-white?’ and Jesus enquires whether a father, asked by his son for an egg, would give him a scorpion. Or asked by his son for a text would give him an egg. Or asked for an egg would give him a text. I hope the chaplain has undertaken a risk assessment of the project. What if recipients become chocoholics? Or spew up in a public place? But let’s not be too hard on the chaps and chapesses of the NDCCU. They are not the only ones to be seduced by chocolate. A nearby parish is going to study the film Chocolat, a syrupy confection, the message of which seems to be that through drooling over chocolate one can discover one’s own individuality and a new sense of freedom. As a reviewer has written, ‘It's like the kind of lesson a schoolteacher might prepare for incredibly sleepy students.’ Would do as a sermon, then! What is it about chocolate that causes people to lose moral and aesthetic perception? I know from my experience as a teacher that youngsters who indulge in chocolate get hyper. But I had not realised that judgement is also impaired. Which leads me to a free range alternative: these students could apply to be Santa’s little helpers. They’d be a lot happier, I’m sure, assembling Christmas crackers. Replacing jokes that aren’t funny with some ‘goo to unleash your sentimental side’ seems relatively harmless and might even raise a laugh.